We've seen in the Profile Designer - Controls topic how you can right-click controls to assign ready-made action templates to your controller. Occasionally, you might find that there isn't a ready-made template for the controls you want. In this case, you can click the "Edit" button and define your own actions in the "Edit actions" window. 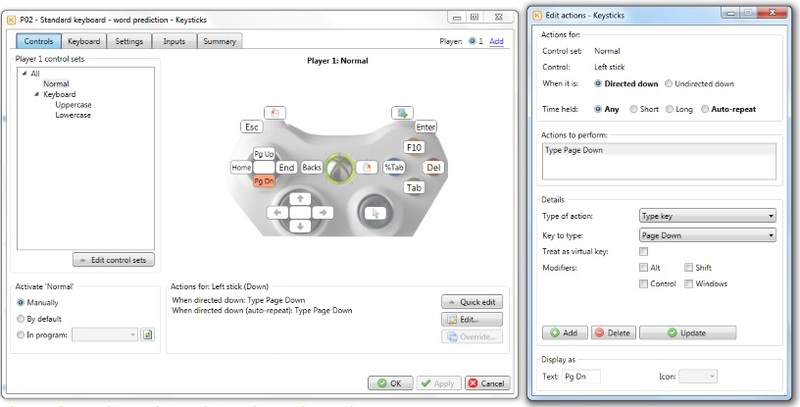 The picture above shows some actions for typing the Page Down key using the Left thumbstick. You can assign one or more actions to perform for each of the ways in which the control can be used: here, by directing the left thumb down or releasing it again ("undirecting" it), and the length of time for which it is held there ("Any", "Short", "Long" and "Auto-repeat"). 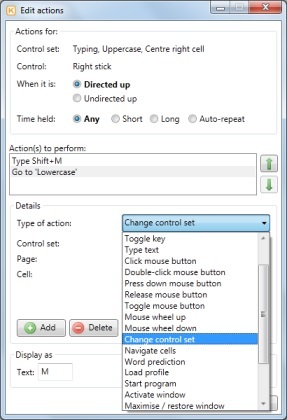 A number of types of action are provided (shown below), for pressing and releasing keys and mouse buttons, switching between control sets, controlling the word suggestions, and so on. A good way to familiarise yourself with the types of action is to explore the sample profiles provided. If you change an existing action, click the Update button and you will see the changes reflected in the Profile Designer window. You can also change the text or icon used to display the actions, though the program's suggestion will usually not need changing. If you specify some text, that will be used, otherwise the icon will be used. Note that Keysticks only changes what your controller does when you click "OK" or "Apply" in the Profile Designer.